Detroit filed the largest municipal bankruptcy in US history on Thursday to seek relief for an estimated $18.5 billion in debt that has crippled the city that was once the hub of American manufacturing. "We did not take this action improvidently, but after careful thought and an assessment, as we have been saying for the past couple of weeks, the negotiations that we have been having with our various stakeholders on the behalf of the city. “We also have been saying for the past couple of weeks that time was drawing nigh and that given the terms as my employment as emergency manager and the amount of time that I have left that we were going to have to make some difficult decisions. Image: A makeshift homeless people's structure is seen with the General Motors world headquarters in the background in Detroit. “It's been widely reported in the press throughout the past week or so, or even more acutely even this afternoon, that those decisions were coming to a head. “We eventually decided that it was an appropriate time to file for Chapter 9 protection." "Bankruptcy, from my perspective, from those of us in this business and restructuring, is a tool. “This is a tool to address the externalities of reality of debt we simply cannot carry anymore so we can get to providing the services that the citizens and residents deserve and put this city on a footing that is sustainable so it can continue to grow and thrive. “So I understand people who don't do this for a living think of this as negative, bankruptcy has a certain connotation to it, but for me, stay tuned. I've heard this before and it hasn't proven to be true." 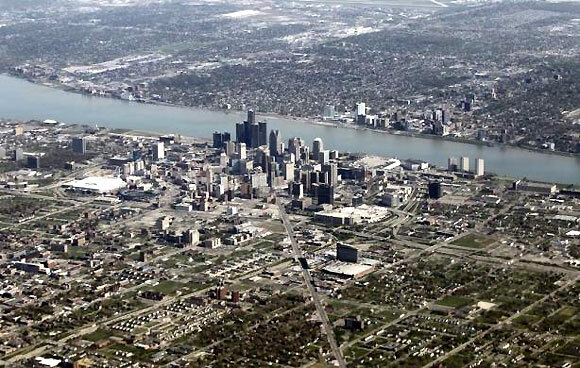 Image: An aerial view of Detroit seen from Air Force One. "As tough as this is, I really didn't want to go in this direction, but now that we're here we need to make the best of it. “I think Kevyn and the team he's brought together has a lot of history of succeeding. “This is very difficult for all of us, but if it's going to make the citizens better off, then this is a new start for us." "As Kevyn continues to negotiate with the credit market, and as we put ourselves in a better position to have a little more cash, we've got to think about reinvesting in the city. "Right now most of the investment has been in downtown and midtown, we have to think about our neighborhoods where so many of our people live. We've got to start reinvesting in those areas and in the services they require." 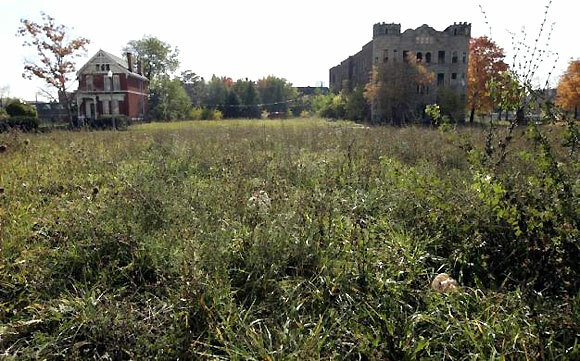 Image: An occupied home and an abandoned apartment building sit on either side of a vacant lot in Detroit. "This was a difficult, painful decision but I believe there were no other options. “Why did I do this? “And what's impact for both the city of Detroit and the state of Michigan? “Well let me start with the fact that this is a situation that's been 60 years in the making in terms of the decline of Detroit. “From a financial point of view, let me be blunt: Detroit's broke." 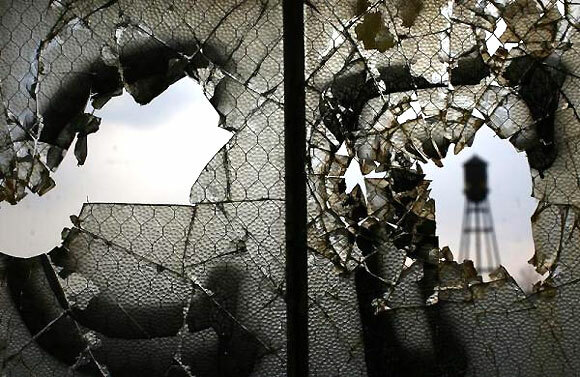 Image: Broken windows are seen inside the abandoned and decaying manufacturing plant of Packard Motor Car in Detroit. "The President and members of the President's senior team continue to closely monitor the situation in Detroit. “While leaders on the ground in Michigan and the city's creditors understand that they must find a solution to Detroit's serious financial challenge, we remain committed to continuing our strong partnership with Detroit as it works to recover and revitalise and maintain its status as one of America's great cities." 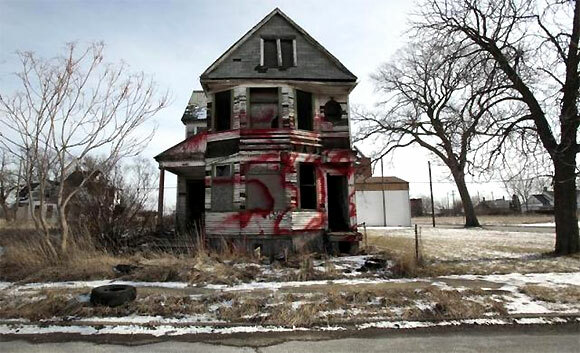 Image: A vacant and blighted home, covered with red spray paint, sits alone in an east side neighbourhood once full of homes in Detroit. "What stands out about Detroit through the centuries is its grit and resilience. “I know firsthand, because I live in Detroit, that our city is on the rebound in some key ways, and I know deep in my heart that the people of Detroit will face this latest challenge with the same determination that we have always shown." "This is certainly one of the greatest challenges Detroit has faced in its long history, but the people of Michigan's largest city have met and overcome tremendous challenges in the past. “There are so many positive things happening across the city, and I have every confidence that Detroit will emerge even stronger and more resilient." 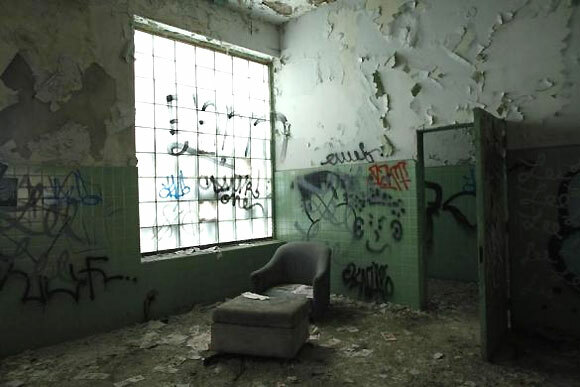 Image: A chair is seen inside the abandoned and decaying manufacturing plant of Packard Motor Car in Detroit. "Despite the Snyder administration's promise that emergency management was going to solve Detroit's problems and help continue Detroit's recovery, all the city has is a stack of legal bills, consultant salaries, an anemic democratic life and the bankruptcy that was supposed to be avoided. The question of long-term municipal debt is a national question. Now Detroit is ground zero over how the problem of dwindling revenue and rising costs will be solved throughout this nation. Whatever the outcome, it is clear that it is immoral and impractical to simply scapegoat retirees and public sector unions and that no solution should jeopardise essential city services." 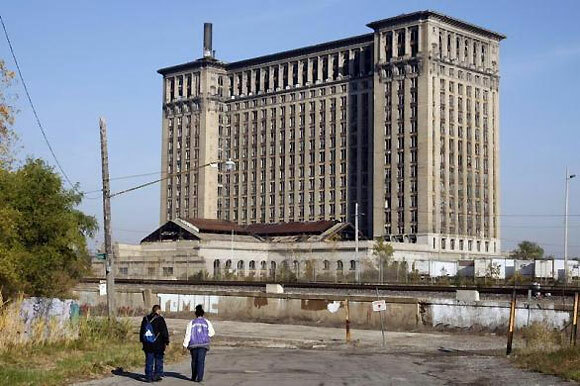 Image: The Michigan Central Train depot sits vacant just west of downtown Detroit. "Bankruptcy is the bold step needed to finally address Detroit's financial problems in a meaningful and sustainable way. “While nobody welcomes the concept of bankruptcy, it is necessary to solve the long-term structural financial challenges of this historic city. “This decision puts the city on a path to achieve its most essential function -- providing Detroiters the services they deserve -- and sets the stage for a growing, vibrant Detroit. The private sector is thriving and businesses continue to invest in Detroit. Addressing Detroit's financial instability is the final barrier to robust growth." Image: A man completes forms for a job at the Michigan Employment center in Highland Park, Michigan. "Like so many with deep roots in this city, the Detroit Institute of Arts is disappointed that the Emergency Manager determined it was necessary to file for bankruptcy. “As a municipal bankruptcy of this size is unprecedented, the DIA will continue to carefully monitor the situation, fully confident that the emergency manager, the governor and the courts will act in the best interest of the City, the public and the museum. “We remain committed to our position that the Detroit Institute of Arts and the City of Detroit hold the DIA's collection in trust for the public and we stand by our charge to preserve and protect the cultural heritage of all Michigan residents." 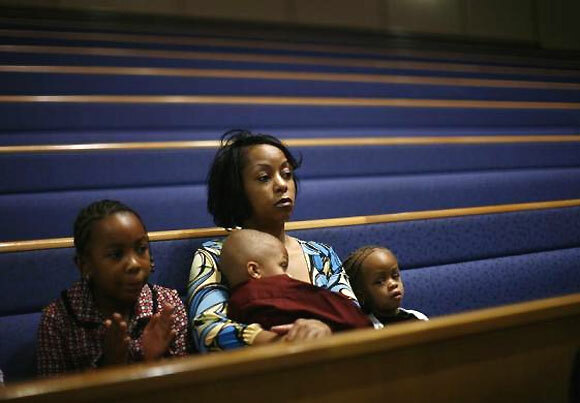 Image: A woman attends a special service with her children to pray for the future of the American auto industry at the Greater Grace Temple in Detroit.